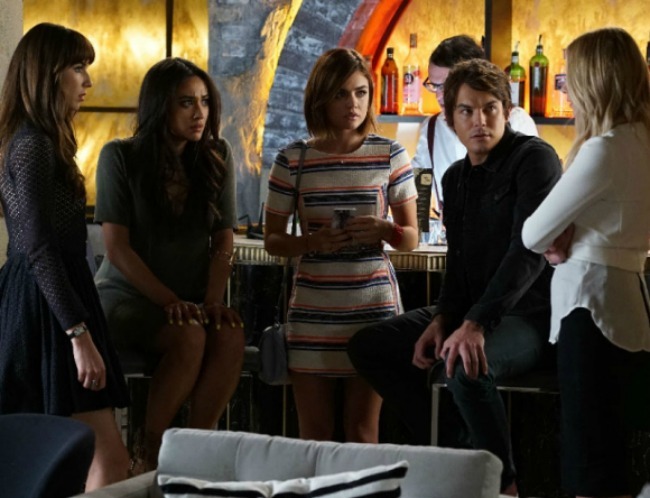 This week's PLL saw more totally threatening A threats (for real. Horror movie material with this one, right?) and random Sara Harvey pop-ups. + First, I feel like we should talk about the notes from A that Aria found in her parents' wedding photos. How much sense does it make that none of the guests would've seen the cards on the table and freaked? A is ballsy, I'll give 'em that. + Why does Sara Harvey seem to show up at every corner? And why do the girls never just call her by her first name? Do they think we'll forget? So many questions. + I've always had such mixed feelings on the whole Aria/ Ezra thing. I mean, I used to think "eh okay" because he didn't know her age when they met. But then (way) back when it was revealed he met her on purpose for book research...... yikes. ANYWAY. Enough about my thoughts.... tell me yours! OH and how do you feel about this whole Caleb/ Toby rift?? Just let bros be bros, man.